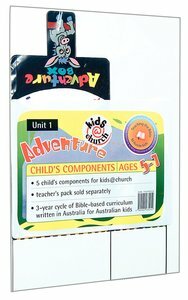 About "Kids@Church 01: Ad1 Ages 5-7 Child Components (5 Pack) (Adventure) (Kids@church Curriculum Series)"
For 8 to 11's, Over the Top is designed for children who are growing in confidence and who enjoy working in small groups with others. Over the Top is written from an understanding that no matter where each child is in their faith development, they can be challenged to respond to God in faith and obedience. Unavailable. This item is Out of Print. The publisher is considering whether to reprint. We will hold your order and notify you if they decide not to reprint.